Marcelo Bielsa - FM17 Tactics - Lille Revival 17/18? 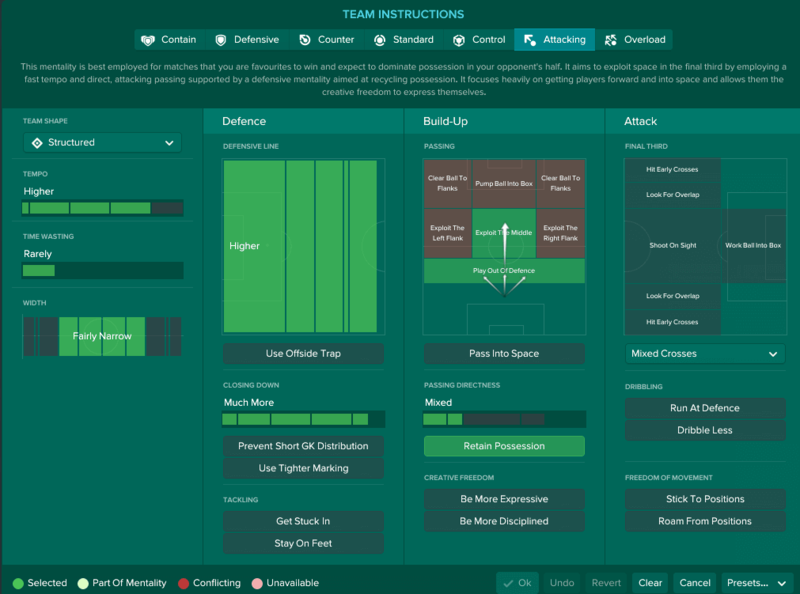 A tactical overview on how to emulate the tactics of Marcelo Bielsa in the Football Manager 2017 match engine. Plus the tactic file itself. Lille Olympique Sporting Club is a football club in the top flight of French football. Competing with the likes of Paris Saint Germain, AS Monaco, Lyon, Marseille and OGC Nice; they have found themselves falling down the pecking order in recent years. This could soon change however with the managerial appointment of Marcelo Bielsa. The club had become a French Champions League regular in the mid-2000s, and earned themselves some remarkable results that decade beating Manchester United 1-0 in 2005, A.C. Milan 2-0 in 2006 and Liverpool 1-0 in 2010. The club currently sit 14th in the league after 10 wins, 7 draws and 16 losses, 5 positions higher than when Antonetti was sacked. Long term coach Patrick Collot took over the struggling club for several months, before being relieved of his duties in February. The club has since been taken over by the former assistant manager of Bielsa until the end of the current season, Franck Passi, until El Loco takes the reigns. Marcelo Bielsa is an Argentinean manager who in the last 10 years has set the footballing world alight, although you might not have realised it yet. Born in Rosario yet supporting neighbouring team Newell’s Old Boys, Bielsa challenged opinion at an early age opting not to support the team his father had followed passionately for many years, Rosario Central. He became a defender playing for his boyhood club but later retired at the age of 25 after moving around the lower leagues in order to concentrate solely on coaching. After qualifying as a physical education teacher, he became first-team coach at Newell’s and went on to win the 90/91 Argentine Primera División and the 91/92 Argentine Primera División Torneo Clausura. Under Bielsa Argentina qualified for the 2002 World Cup but were knocked out disappointingly in the first round. Despite this setback Bielsa remained in charge and led Argentina to runners up in the 2004 Copa América (losing 4-2 to Brazil on penalties) as well as winning of Gold at the 2004 Olympic Games. In 2007 Bielsa became the national coach of Chile, leading them to the success of qualifying for the 2010 World Cup after missing out on the previous two successive tournaments. In 2011 Bielsa returned to club football by taking up the manager’s post at Athletic Club in Spain. They enjoyed a relatively successful first season under El Loco, disappointingly finishing 10th in La Liga, they qualified for the Europa League after finishing as runners up to Barcelona in the final of the Copa Del Rey. The club also enjoying a good run in Europe, finishing as runners up in the Europa League to Atlético Madrid. After Javi Martinez was sold to Bayern Munich and Fernando Llorente was used sparingly due to contractual disagreements, the following 2012-13 season ended disappointingly for Bielsa. The following year Bielsa was hired by Marseille and would start his 2 year contract after the 2014 FIFA World cup. His first season again had mixed results. Despite poor cup form Marseille finished the season 4th placed in Ligue 1 achieving automatic qualification to the Europa league group stage for the 2015-16 season. In 2016 Bielsa was appointed manager of Serie A side Lazio for the 16/17 season. His appointment was short lived however, and Bielsa resigned as manager just two days after his appointment. Bielsa later claimed that the club had previously agreed to make signings, however having failed to transfer any of Bielsa’s shortlisted players, it was clear to Bielsa that his time at Lazio would not work out. It’s simple. The man is obsessive. Having become famous for collecting video tapes of football, he has spent hundreds of thousands of hours watching and analysing the beautiful game. When he took over as coach of Newell’s in 1990 he immediately made changes, not only in terms of training but also tactically. He implemented a 4-3-3 system which was capable of changing to a 3-4-3 when required, similar tactics to which we have seen Guardiola use during his spells at Barcelona and Bayern Munich today. He reduces his philosophy to 4 terms: “concentración permanente, movilidad, rotación y repenitización.” Translated to concentration, movement, rotation and spontaneity. He believes in winning the ball back as close to the opponent’s goal as possible and translating this defence into attack, using movement to create space, allowing for players to express themselves fully and act with imagination and spontaneity. What is this style of football? It’s loco. Pep Guardiola and Mauricio Pochettino are only two people on a long list of managers to have been influenced by Marcelo Bielsa. Bielsa often seeks to overload his defence with a spare man and play an enganche behind 3 forwards when in attack. The transition time taken between these two tactics is constantly looking to be shorted by Bielsa so that his defence is stronger and so that attacks are more threatening. This is something we have seen Pep Guardiola implement both at Barcelona and Bayern Munich. 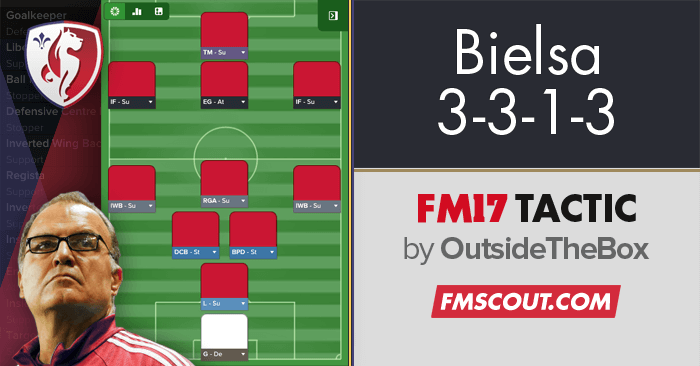 Bielsa often seeks to have his team transition between a 3-3-1-3 formation when in attack and a 5-3-2 formation in defence. Whilst in attack the two central defenders spread apart allowing the libero to step forward to make a back three. The two full backs move into central midfield alongside the midfielder to create a three-man midfield. The other midfielder moves forward behind the striker and the two wingers seek to cut in with the ball. Creating his famous 3-3-1-3 formation. 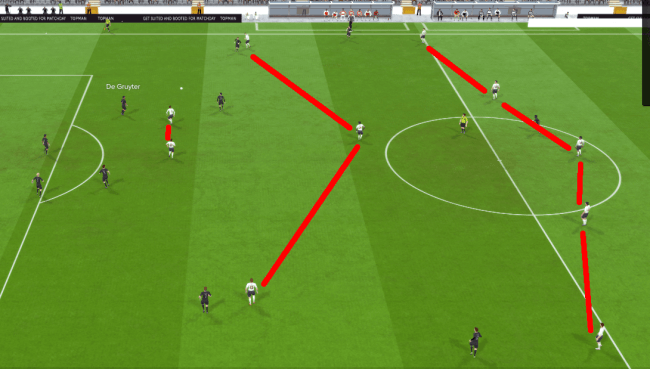 When transitioning into defence the libero steps back into the role of a sweeper whilst the two centre backs come closer together to narrow any space which the opposition can attack. 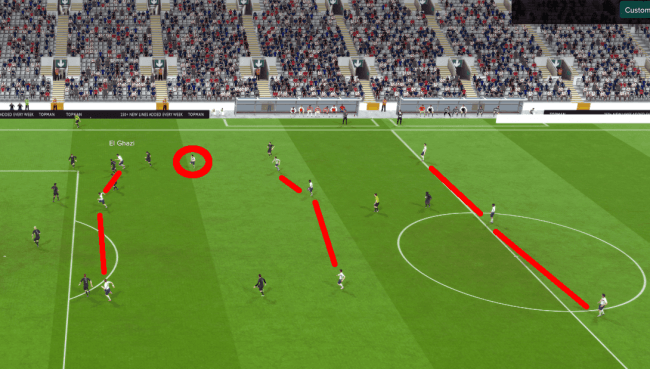 The two full backs move out wider whilst remaining close to the centre backs, and the wingers move in centrally to help the lone defensive midfielder. The enganche keeps his role as playmaker behind the attacker and serves as the main outlet when defence is transitioning to attack. This is very similar to how Pep Guardiola has implemented tactics in the past with Barcelona and Bayern Munich. At times, he opted to play two full backs Lahm/Rafinha or Alaba/Bernat. 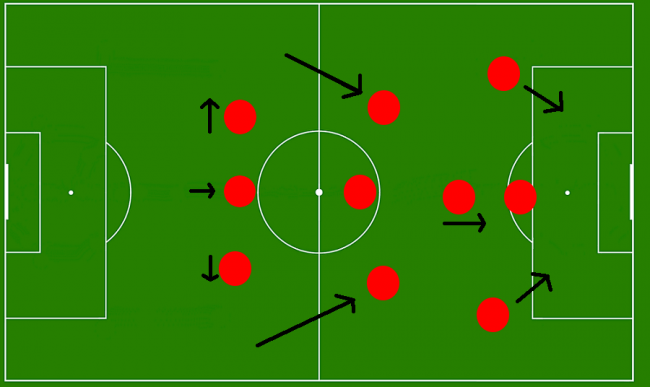 This tactic not only allowed faster transition, but also a much stronger defence. By doing it this way Guardiola seeks to exploit either the left or the right when attacking, depending on which full backs he deploys. Giving his team a greater level of fluidity than Bielsa’s while keeping the core thoughts and ideas of the coach he deemed the best in the world in 2012. Mauricio Pochettino’s adaption of the Bielsa’s tactics can also be seen during both his spells at Southampton and Tottenham. When attacking he likes to use a similar 1-3 formation in the attacking third. However only opts for two at the back, perhaps due to the defensive capabilities of Dier in midfield or the sweeper keeping prowess of Lloris in goal. In defence Pochettino also adapts a similar tactic by getting his wingers close to the two central midfielders whilst getting the full backs to drop back, creating a solid block which can quickly turn defence into attack through Eriksen when they win back the ball. These are just two managers Bielsa have influenced, but perhaps his greatest successes. Guardiola has had undoubted success with both Barcelona and Bayern Munich, while Pochettino in recent times has been touted as the best manager in the English Premier League by several journalists and fans alike. However the list of other managers who have been influenced by him boasts the likes of former Barcelona manager Gerardo Martino and current Atlético Madrid manager Diego Simeone. After influencing a few of the best managers in the world to become who they are today it could be argued his influence has brought the most success in football over the past 10 years. So whilst his trophy cabinet may not be impressive, the world class list of managers who all admire Bielsa and use his ideas is unquestionable. El Loco a failure? Think again. Coming into a Lille club who have stagnated since peaking and winning the league in 2011, Bielsa will perhaps be the man to spark a revival of the club currently sitting 14th in Ligue 1. Though he will undoubtedly make changes, Bielsa will be glad to have his assistant manager already at the club to give them a taste of what’s to come. The ambition of the club has been displayed across Europe in hiring Bielsa and the transfer rumours in January saw the club linked with a few talented players, including recent Chelsea signing Michy Batshuayi (Daily Mirror). Bielsa likes his board to back him during the transfer window and I’m certain we’ll see some interesting signings before the 17/18 season starts. I am going to try and replicate Bielsa’s tactics at Lille. The main focus on general training I will set to “fitness” due to the high levels of stamina needed in a Bielsa tactic, due to his high pressing game. I’m also going to set the match preparation to defensive positioning. This is due to the awareness his players must possess as well as Bielsa’s need to fit players into his tactic. There are no stars in a Bielsa team, when one player is injured he is replaced and the tactic always stays the same. The team will play attacking and structured with 7 team instructions. These instructions will reflect Bielsa’s previous squads who worked hard using both order and discipline during attacking and defensive phases. Pressing high, playing narrow in attack and attacking with pace whilst retaining possession is the main focus of El Loco’s squads. While the player roles work to create the formations which Bielsa uses. The team is highly attacking but the structured ordered also it to maintain its shape when needing to defend. By closing down much more with a high defensive line, the team presses to win the ball back from opponents as quickly as possible. They retain possession as they seek to attack, but are not looking to work the ball into the box, instead waiting patiently, creating space until they are ready to strike. The target man will move into channels, drifting wide to give inside forwards more space to roam inside, or to allow the enganche to get further forward and attack. The inside forwards on both side will look to play alongside the striker as a bank of 3 in front of the enganche. More direct passes focus the enganche on attacking and setting up chances, the majority of goals should come through his assists and the three men in front of him should be getting the majority of the goals. He operates between the two banks of 3, and uses the space to drift and run in empty areas of the pitch. The regista will sit behind the enganche, pulling the strings and passing the ball forward. He will look to receive the ball when it is won back and play quite creatively in midfield whilst the attackers in front of him move into better goalscoring positions. The two inverted full backs will look to play alongside the regista in a bank of 3 when in possession. They will be responsible for winning the ball in midfield and providing the regista with the chance to create play. If they need to they will also be capable of dribbling the ball out of danger or playing more risky passes ahead to the attacking players. Whenever defending, these two players will drift back to more natural full back positions either side of the centre backs. The team then plays with a back 5 to provide a more robust challenge to the opposition. The left defensive centre back will be focused on simply defending, taking a no-nonsense approach to defending and clearing the ball when required. This is so that the team do not always attempt to play out from the back, and instead clear their lines whenever they are in danger. The ball playing centre back will look to play the ball to the regista whenever the ball is won back. This allows the team to quickly attack and make best use of their possession and the chance to counter attack. Perhaps the most important role on the pitch, the libero offers both defensive and attacking qualities. Playing behind the centre backs when out of possession and offering a last chance solution, he is often the last line of defence. When in possession however he will look to attack and sit further up the pitch, offering the team another outlet for chance creation and recycle the ball when in possession. The Target man in this tactic will hold up the ball for the inside forwards and the enganche who will be looking to push forward when in attack. The enganche will sit in behind, looking for the perfect pass when in possession, and looking to get further forward and into space whenever a team mate has the ball. The inside forwards will look to sit narrowly, cutting in and effectively making a front 3 in front of the enganche. Behind the enganche the regista will be looking to pull the strings, and will form a midfield alongside the two inside forwards. The back three will see the two centre backs spread and the libero step forward creating a defensive back 3 whenever in possession of the ball. Creating Bielsa’s famous 3-3-1-3 formation when the team is in possession and attack. When out of possession the team will look to revert to the 5-3-2 which Bielsa plays. The inverted wing backs will step back alongside the centre backs. The libero will drop slightly deeper and look to provide the defensive cover in that “spare man” role which Bielsa loves. The two wingers will drop into midfield alongside the regista to create a centre midfield 3 whilst the enganche and target man will remain up front to provide a counter attacking option whenever the ball is won back. Bielsa’s attack and defence transitioning side has been successfully replicated using the Football Manager match engine. 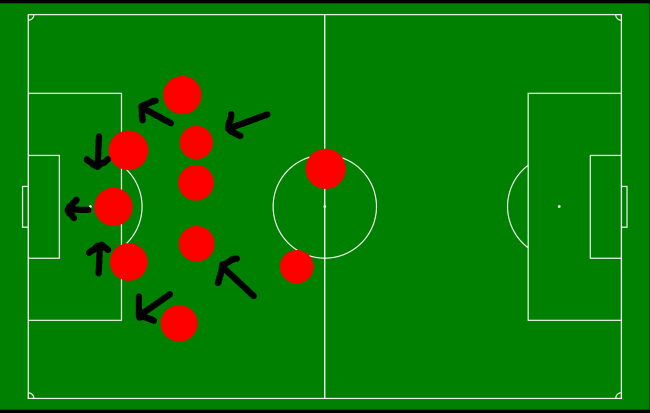 This was the main aim which I set out with at the start of creating this tactic. Like any of my tactics this tactic is not for results, simply to emulate the style and positioning of a football manager in Football Manager. We have seen managers across Europe such as Pep Guardiola, Pochettino and Diego Simone, influenced by Bielsa and create their own unique brand of football. Can Bielsa finally make an impact at Lille and get his hands on his first piece of silverware in Europe? We’ll find out in the 17/18 season. I hope you enjoyed reading about Marcelo Bielsa’s tactics and enjoyed my interpretation of them. Discussion: Marcelo Bielsa - FM17 Tactics - Lille Revival 17/18? What sort of OI's you using on this mate?